In reference to Passover, the Quartodecimans claimed that they had based their practice upon the custom followed by the messiah and his disciples as well as upon the commandments found both in the Old and New Testaments. The 14th (Hebrew reckoning), accordingly, was not only the day when the messiah ate the Passover lamb; it was also the day on which his murder took place. This data also proves that the Quartodecimans understood the scriptural day as beginning with sunset and byn ha-arabim. In the early third century C.E., a Quartodeciman named Blastus was keeping the festival and supper on the 14th in Rome. These statements are vitally important in that they express the Quarto­deciman understanding that the written Torah, and not just the messiah and his apostles, taught that the Passover supper was to be kept on the 14th. Another important example comes from the records retained from the debate in 196 C.E. between the Quartodecimans of Asia and the leadership of the Roman Church,18 then headed by Victor. The problem with the Quartodeciman view for those living during the latter half of the second century C.E. in the West and under Western and Roman guidance was that the Quartodeciman Passover too closely resembled the dominant practice of the Jews. True, these Jews did not eat their Passover supper until the 15th, while the Quartodecimans held their festival and supper on the 14th. This common point of reference gave the opponents of the Quartodecimans a weapon that enabled them to discourage and suppress the use of the Christian form of System A. The Quartodeciman practice was the earliest known for the original Christian assemblies. 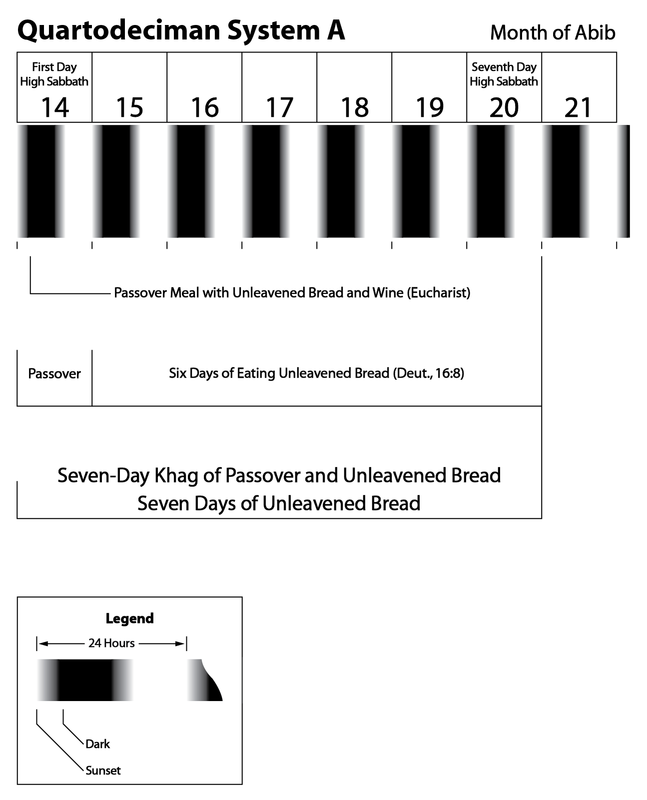 For the Quartodecimans, System A established the correct method of observing the Passover supper as instructed by Yahushua the messiah and the written Torah. It was in the nighttime portion of the 14th day of the moon of Abib (Hebrew reckoning) that the messiah kept the Passover. Since this Passover occurred on the date of his death, it was his “Last Supper.” After that dinner Yahushua was betrayed; and during the remaining parts of that same 14th day (Hebrew reckoning), he suffered and died. In the opinion of the Quartodecimans, the state religion practiced by the Jews (i.e., the Pharisaic form of the Hasidic religion), which observed the Passover supper on the night of the 15th of Abib, was a false system. Therefore, when the Scriptures speak of those Jews who on the morning of the messiah’s death were still waiting to observe their Passover supper and great Sabbath,20 the Quartodecimans believed it was based upon a Pharisaic misinterpretation of Scriptures. Yet, it was also necessary for Scriptures to mention this Passover of the Pharisees, since it was the historical occasion and backdrop for the messiah’s martyrdom. All of the ancient testimony reveals that all the earliest orthodox Christians, referred to as the Quartodecimans, observed the Festival of Passover and Unleavened Bread for seven days, Abib 14-20. The first of the seven days began at byn ha-arabim after sundown at the beginning of Abib 14. The Passover meal was eaten at the beginning of Abib 14. This day was also a high Sabbath day. The last and seventh day began at byn ha-arabim after sundown at the beginning of Abib 20 and ended at the following sundown, being exclusive of Abib 15. Abib 20 was also a high Sabbath day. What we have uncovered so far is that the evidence is consistently pointing to the authentic and original Passover observance of the early followers of Yahushua the messiah. As we proceed forward, more information will be provided that will help establish the true and correct practice of the Festival of Passover and Unleavened Bread. Needless to say everyone, be sure to be on the lookout for the next installment dealing with evidence for the Quartodeciman practice of the seven days of Unleavened Bread. Who knew that history could be so interesting? 1 Chrysostom, Adver. Jud., 1 (PG, 48, p. 848). 2 For example see Tertullian, de Orat., 23:1–2, de Bapt., 19:2; Origen, Celsus, 8:22; Eusebius, Pas., 4; Athanasius, Fest. Let., 1:10, Fest. Let., 14:6; Didymus, 5:88; Syn. Elvira, Can., 43; Ambrose, Exp. Luc, 10:34; Apost. Constit., 5:20:2; Theophilus Alex., 20:4; Egeria, 43; ACC, 2, pp. 1157–1161. Pentecost also went through a transition among Christians. “By the beginning of the 4th century C.E., Pentecost has lost its ancient christological content and it is seen as the feast of the descent of the Holy Spirit” (EEC, p. 208, 123, n. c; cf., Paulinus, Poem, 27; Augustine, Serm. Mai, 158:4). 3 Philo, Exod., 1:9, Spec., 2:27. 5 Chron. Paschale, 1, pp. 13f. 6 Peter Alex., frag. 5:7. 8 JTS, 25, p. 262. 9 1 Cor., 11:20-27, esp. v. 23; cf., Mark, 14:17-30; Matt., 26:20-35. 10 Epist. Apost., 15. The section intends to foretell the imprisonment of Peter during the days of Unleavened Bread in the story of Acts, 12:1-19. In this passage of the Epistula Apostolorum the Quarto­deci­mans were advised to “celebrate the remembrance of my death,” “celebrate the Passover,” and the “Agape (Love Feast).” Passover was to be spent as a “night of watching” and “remembrance” that ended at “the cockcrow,” i.e., 3 A.M. Cockcrow was the time of Peter’s third denial of the messiah on the night of the “Last Supper” (Matt., 26:34, 74-75; Mark, 14:30, 68-72; Luke, 22:34, 60-61; John, 13:38, 18:27). Unfortunately, the above passage from the Epistula Apostolorum has been construed by some to mean that the Quartodecimans were fasting until 3 A.M. (e.g., EWJ, p. 123). This view is a matter of overinterpretation; nothing of the sort is even suggested in the text. To the contrary, the “Agape” or “Love Feast” and the “celebration” of the Passover are references to the Eucharist (the ritual of the bread and wine) and Phasekh supper. To superimpose a fast is totally unwarranted. 11 Eusebius, H.E., 5:22; Jerome, Lives, 45. 13 Eusebius, H.E., 5:24:6f; cf., Jerome, Lives, 45. 15 A Quartodeciman quoted by Hippolytus, Ref. Her., 8:11. 17 Ps.-Tertullian, 8. This work is an epitome of Hippolytus’ lost Syntagma. Chap. 8 deals with the Quartodeciman named Blastus (JTS, [NS] 24, p. 83, n. 2). 18 Jerome associates this debate with the fourth year of Emperor Severus (196/197 C.E., May reckoning) (Jerome, Euseb., year 2212). 19 Eusebius, H.E., 5:23:1. Cf., translations in Lake, Euseb., i, p. 503; EEC, p. 33. 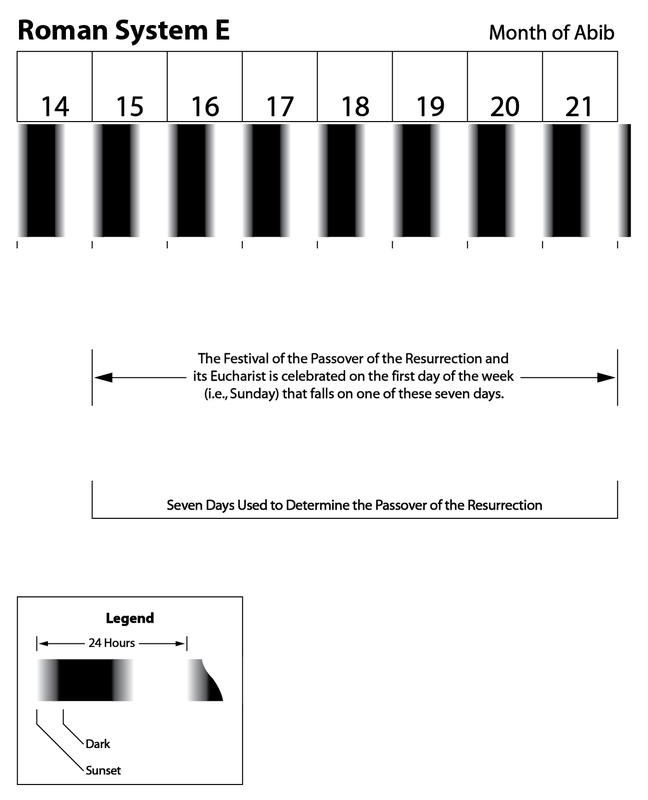 This entry was posted on 02/01/2013, 12:18 pm and is filed under Calendar, Easter, Feast Days, High Sabbaths, Holy Days, Passover, Quartodecimans, Religion, Tekufa, Tekufah, Tequphah, Tequphath, Unleavened Bread, Vernal Equinox, Yahweh. You can follow any responses to this entry through RSS 2.0. You can leave a response, or trackback from your own site.